Guerrillas shot dead 8 oil workers at the Baiji refinery north of Baghdad. The guerrillas have for some time had a strategy of cutting the capital off from fuel and electricity as far as they can, and their sabotage in Baiji is for this purpose. At the same time, they siphon off the fuel and smuggle it out to fund the insurgency. Grand Ayatollah Ali Sistani has blown off the president of the United States. Bush sent Sistani a letter asking him to intervene to help end the gridlock in the formation of a new Iraqi government. Asked about his response, an aide said that Sistani had not opened the letter and had put it aside in his office. Sistani does not approve of the American presence in Iraq, and certainly disapproves of the Bush administration’s attempt to unseat Ibrahim Jaafari as the candidate of the United Iraqi Alliance. Middle Easterners have had Western Powers dictate their politics to them for a couple of centuries and are pretty tired of it. It is rumored that after the December 15 elections, Bush told Jalal Talabani, the Kurdish President of Iraq, that he would prevent the Shiite coalition from taking power this time, which encouraged Talabani to try to unseat Jaafari. Bush’s plan, however, would only work if the neo-Baathists, the Sunni fundamentalists, the Kurds and the secular Shiites can consistently work together, and if a substantial number of Shiites defects from the United Iraqi Alliance to help elect a president by 2/3s majority. Pigs will fly first. Meanwhile, Bush’s tinkering with Iraqi politics has contributed mightily to the gridlock in forming a government. Jaafari’s bargaining position has been perhaps fatally undermined. And Washington is blaming the Iraqis! At least Bush is a consistent foul-up. Reuters points out that Sistani is not only highly influential in Iraq but also in Pakistan. Rumors circulated earlier on Thursday that the Sadr Bloc was reconsidering its commitment to Jaafari. Jaafari won the internal party vote because he was backed by the two branches of the Dawa Party and by the 32 Sadrists. Jaafari’s candidacy has been rejected by three of the other major parties representing Kurds, Sunni Arabs and secular Shiites. The Fadhila or Virtue Party, a branch of the Sadrists that follows Shaikh Muhammad Ya`qubi and dislikes Muqtada al-Sadr and Ibrahim Jaafari, is suggesting that Jaafari’s candidacy be submitted to the whole parliament. A source told KarbalaNews.net that 75% of the members of the UIA (Shiite religious parties) agree with this proposal. Jaafari’s candidacy is one issue that is holding up the formation of a new government. Another such issue is which parties will get which ministries. The United Iraqi Alliance is trying to keep control of the security ministries, on the grounds that they should be controlled by the prime minister and his party. They are trying to convince the Sunni religious coalition that this is only fair. Minister of the Interior Bayan Jabr argues that the guerrilla insurgency is led by 16,000 Iraqi ex-Baathists. Al-Hayat reports on remarks of Abdul Karim al-Anizi [Ar. 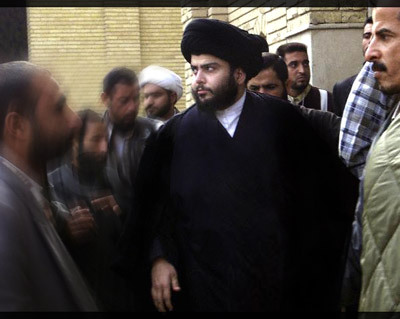 ], leader in parliament of the Dawa Party – Iraqi Organization, which has about 15 seats. He is also minister of national security. He denied that Iran is contributing to instability in Iraq. He also accused the United States of training “an Iraqi military force loyal to it, which does not submit to the authority of the Iraqi government.” He said that the recent US and British escalation of military action against the Sadr Bloc is “unjustified.” He also criticized the remarks of Arab League Secretary General Amr Moussa about the Arab role in Iraq. Al-Anizi told al-Hayat that “a new army has appeared on the Iraqi scene, recruited by the Coalition forces, which does not receive its orders from the Iraqi government.” He affirmed the existence of intelligence documents proving that members of the Iraqi Forces who are primarily loyal to the US have commited crimes, disguising themselves in civilian dress. He referred to ongoing investigations, which he said might result in prosecutions. He said that US and other Coalition forces has damaged the sovereignty of Iraq and have undertaken a role in Iraq that exceeds their legal charge. He referred to UN resolution 1546, which prescribed coordination and cooperation between the foreign forces and the Iraqi government, and which did not grant the occupying powers absolute freedom of movement. The UN resolution required the Americans to get the permission of the Iraqi prime minister for any military operation in the country. He revealed the existence of 15,000 detainees in Coalition prisons, many of them innocents who have no connection to terrorism. At the same time, he said, the number of detainees in the prisons of the ministries of interior and defense does note exceed 900 persons. Al-Anizi complained that some personalities in parliament had deep links with the Sunni Arab guerrilla movement (“the terrorists”).